During Thomas’s lifetime there were no train stations, superhighways, or airports. The transportation system consisted of a network of roads that, by today’s standards, would be considered “poor” – hardly more than broad paths through the forest. In wet areas they were deeply rutted with large muddy holes, and in dry areas the surface was often covered by a deep powder of fine dust.1 In these early years, building roads was the responsibility of the community, and there were always debates about who would be responsible for upkeep. Most Americans realized the need for improved transportation systems if the country was to continue to grow and develop economically. One way this was achieved was through building turnpikes, which were financed almost entirely by corporations. Companies were granted charters and then sold stock in order to raise money to pay for building the roads. Like many merchant capitalists of his day, Isaiah Thomas was a leader in organizing and financing such new ventures. He bought stock in many turnpike corporations, including the Boston-Worcester Turnpike Company, and he was elected to serve on the company’s board of directors.2 He realized the important role these new roads would play in the distribution of goods, including his newspapers, books, and other printed materials. 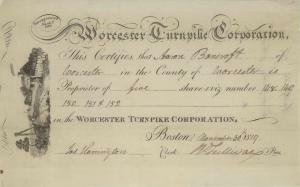 On pages 2 and 3 of this document, you can see examples of stock certificates signifying Thomas's involvment in the turnpike corporations. The most active period of turnpike building in New England came in the early 1800s. Typically, turnpikes were built over routes where water transportation was not available, so the roads usually ran in an east-west direction. Turnpikes were generally built on a bed of gravel topped by smooth stones. This construction allowed water to easily drain off of the road’s surface, minimizing the mud and muck that would slow a wagon or coach. Every few miles along the road a pike (pole) would block the road. The traveler who wished to pass would pay the pike keeper a toll, and the pole would be turned aside so the traveler could pass. Hence, the term “turnpike”. This system worked well during daylight hours when the pikes were attended by keepers, but sometimes teamsters (men driving the teams of horses and wagons) would wait until the evening when the pikes were unmanned, and sneak through without paying the toll. Many “shunpikes”, which were roads that led around the turnpikes, also developed allowing travelers to bypass the tolls. 1. George Rogers Taylor, The Transportation Revolution: 1815-1860, vol. 4, The Economic History of the United States (New York: Rinehart & Company, Inc., 1951), 15. 2. Isaiah Thomas Papers, American Antiquarian Society Collection, Boston-Worcester Turnpike certificates, folder 2, box 14.